Redecorating a plain fire pit with mosaic tile transforms the look of your outdoor living area. 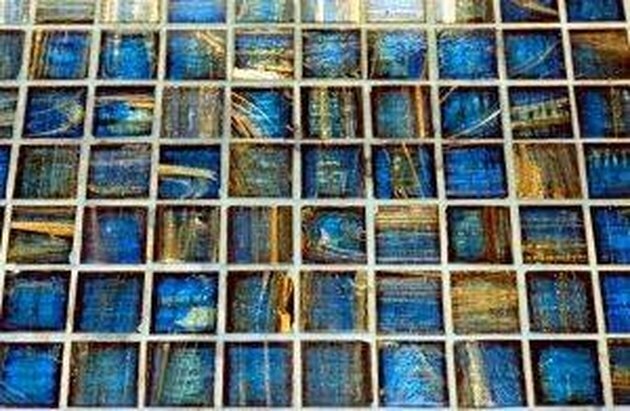 Installing mosaic tile is a simple craft project that anyone can do with a few materials and a bit of instruction. Don't stop with your fire pit -- install mosaic tile on your outdoor tables, flower pots and fountains for a colorful and creative way to spruce up your patio and garden décor. Clean out the fire pit and turn it upside down. Clear any soot or debris from the outside of the fire pit so that you can begin tiling on a clean surface. Spread a small amount of thinset on one section of the outer rim of the fire pit. Because the fire pit is upside down, the rim is now at the base and resting on the surface of your work table. Scrape the top of the thinset with the jagged edge of the trowel. This will allow the mosaic tiles to cling better to the adhesive as it dries. Press the mosaic tiles firmly into the thinset. You can work around the perimeter of the fire pit, then move upward, or you can work in strips from the rim to the base, which is on top now that the fire pit is inverted. Continue to work in small sections so you have time to place the tile before the adhesive begins to set. Finish tiling your fire pit and let the adhesive dry. Flip the fire pit over and tile around the rim(this section was resting on the work surface as you tiled the bulk of the fire pit). Let the adhesive dry. Flip the fire pit back over and apply grout to the crevices between the mosaic tiles. Your grout float works well for this, but you can also use your fingers. Remove any excess grout with warm water and a sponge before the grout has a chance to dry on the surface of the tiles. Let the grout dry, then flip it and grout the rim. Apply grout sealer to the tiled surface of your outdoor fire pit after the grout is completely dry. This will protect the grout lines from moisture and stains.